“`Traveling to a Broadway show is a special experience. But, there’s something to be said for enjoying live theater without even leaving the comfort of your living room. 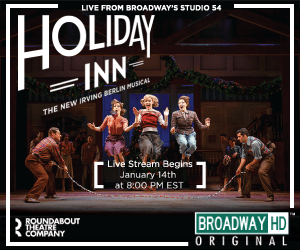 On January 14th, theater fans around the world will get to view a show at home, when BroadwayHD streams their evening performance of Roundabout Theatre Company’s production of Holiday Inn The New Irving Berlin Musical from Studio 54. “`Holiday Inn is the last production of Roundabout Theatre Company’s 50th anniversary season. BroadwayHD partnered with the not-for-profit company in June, when She Loves Me was the first Broadway show to be live-streamed. After their collaborative success, they are teaming again for this one-night-only event. “`Inspired by the 1942 film, Holiday Inn is directed by Gordon Greenberg, and features choreography by Denis Jones, and an Irving Berlin score, such as the iconic Blue Skies, Steppin Out with My Baby, and of course, White Christmas. The production stream is through BroadwayHD with the use of high-definition cameras. Director David Horn is at the board. It’s in conjunction with Thirteen Productions LLC and Universal Stage, a theater division of their cinematic studio. “`More than 3,000 students and teachers have watched Holiday Inn for free or reduced rates; in addition to, 20,000 subscribers and audience members. “`BroadwayHD, the only online streaming service of its kind, launched in 2015. In addition to the live stream, subscribers can access over 160 theater productions on demand. Titles in the library include Gypsy, and Oklahoma! starring Hugh Jackman. “`The stream will also include interviews with the cast and its creative team, and feature behind-the-scenes footage. The live stream will be available on BroadwayHD.com and Chromecast. Subscribers can access from BroadwayHD’s Roku, Apple TV, iPad, and iPhone apps. Visit BroadwayHD.com to sign up. “`It’s still not too late to enjoy the Holidays! This entry was posted on Friday, January 13th, 2017 at 3:36 am	and is filed under Blog by Manny Pacheco. You can follow any comments to this post through the RSS 2.0 feed. Responses are currently closed, but you can trackback from your own site.